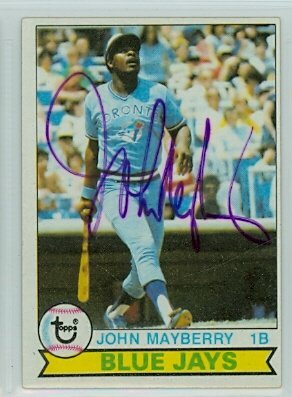 I loved Mayberry while he was a Jay. He was on the downswing by then but he was the first legitimate power hitter the team had. It was fun watching his towering shots leave Exhibition Stadium. He was a great player for a kid to see. “We played in North York three years in a row,” Mayberry said. “Their shortstop would take three of our kids home for lunch, the left fielder would take three more. We’d come back and play again. BBB published an interesting piece about Mayberry's career, suggesting that Mayberry had a cocaine problem with his previous team, the Royals, and that's why he was traded here. I'm not sure how much of it is true (I suspect he was hung over rather than on drugs) but my 11-year-old self doesn't really care. He befriended Alison Gordon and hit homers and that's enough in my book. I haven't been able to find out anything about his life after baseball. When he retired, he worked with the Jays as a minor league instructor for 5 years before he found himself back with KC, first as a coach then working with the Community Affairs Department (he's not listed there currently so I don't know when he stopped). Fences were mended and he was inducted into the KC hall of fame in 1996. You would think with his son in MLB I'd be able to find out more about what he's been doing (a la Steve Grilli) but the internet has been silent. Hope he's doing something interesting. Love ya, Big John.